A couple of unexplained large scale changes in the waters off the northeast coast of the U.S. have oceanographers perplexed: an accelerated rate of sea level rise compared to most other parts of the world; and the disturbing signs of collapsing fisheries in the region. A new study by physical oceanographers at Woods Hole Oceanographic Institution (WHOI), published in the Journal of Geophysical Research, shows that water temperatures in this continental shelf region have been trending upward, with unprecedented warming occurring over the last 13 years. The study also suggests a connection between sea level anomalies and water temperature along the continental shelf. The scientists compared their findings with a study of surface waters using data collected by Nantucket Light ship, and other light ships up and down the East Coast between 1880 and 2004, previously analyzed by Steve Lentz of WHOI and Kipp Shearman of Oregon State University. 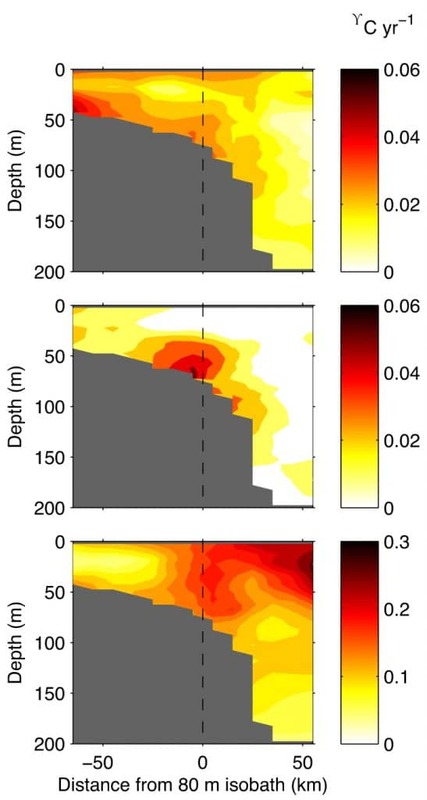 The new study shows that recent accelerated warming is not confined to the surface waters, but extends throughout the water column. “Others have reported on the temperature increase in this region,” says Gawarkiewicz’s colleague, WHOI assistant scientist Magdalena Andres, “but they’ve been confined to looking at the surface temperatures from satellites or buoys.” And Gawarkiewicz and Andres wanted to understand how deep the warming went. The research is based upon a rare collection of temperature data from the waters off the northeast coast of the U.S. that were collected in collaborative effort between scientists and the operators of the container ship Oleander, which routinely travels between Bermuda and New Jersey. The effort, which began in the late 1970s with funding from NOAA/NMFS, involved launching bathythermographs along the ship’s track to collect temperature data approximately 14 times each year. Later the program was funded through the National Science Foundation and the University of Rhode Island and Stony Brook University. The bulk of the prior analysis has been on velocity data also collected by the Oleander. That’s where Jacob Forsyth, lead author of the study, came into the picture. In 2014, Forsyth had just begun an 11-week summer student fellowship at WHOI, with Andres and Gawarkiewicz as his co-advisors. “On a lark, we had Jacob look at the data, not knowing if it would pan out,” says Andres. “But it was a super data set, and Jacob did a great job analyzing the data,” she added. A physics and economics major at Bowdoin College, Forsyth had taken just one college oceanography course but had a passion for the ocean and for science. Early into his fellowship, Forsyth found himself at WHOI immersed in the academic literature, quality controlling nearly 40 years’ worth of data, and teaching himself MatLab to begin looking at this database no one had really assembled before. The bulk of the data were collected by volunteer observers who rode the Oleander from New Jersey to Bermuda at monthly intervals deploying the bathythermographs, a probe that is dropped from a ship to measure the temperature as it falls through the water. Two very small wires transmit the temperature data to the ship where it is recorded for later analysis. Because water temperature can vary by layer, it was important to obtain information on the temperature structure of the ocean to depths of up to 700 meters. More recently an automated data collection system has been used which was developed by Dave Fratantoni, formerly of WHOI. The researchers looked at the temperatures for a given year and averaged them across the shelf, to get a temperature index for the year. Their work showed that temperature has been steadily increasing, and most recently, it’s been getting warmer, faster. Superimposed on that, they found a lot of year-to-year variability. What the researchers did determine is that the slow, sustained warming is not just due to warming of the atmosphere, but that it’s something related to dynamics of the shelf break, where the shallow continental shelf abuts the deeper continental slope. “The warming more recently seems to be at the edge of the continental shelf, which would indicate there might be a Gulf Stream role or a slope water role in the warming,” says Gawarkiewicz, “and that’s different than if it was all from the atmosphere over the last 12 years, because that would be uniform and near the surface.” Investigating the exact cause is among their next steps. 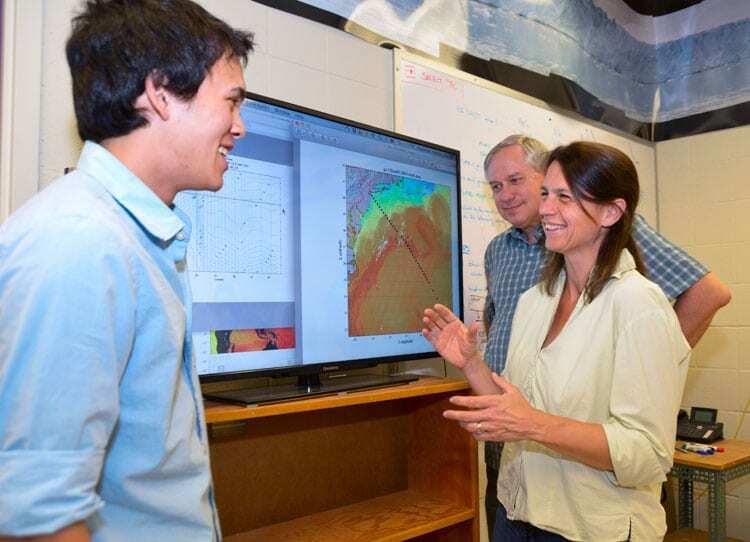 In addition to analyzing the warming trend, Forsyth, who will enter the MIT-WHOI Joint Program in Oceanography this summer, used the data to search for a relationship between sea levels and temperatures. He found, in fact, there is a very strong relationship between the two, where sea level anomalies may serve as a predictor of shelf temperature. Forsyth determined the lag between the two indicators was approximately two years – enough time to give environmental monitors a chance to respond. The researchers underscore the importance of a long, continuous set of measurements, and that they are hard to come by due to the limitations of funding. The Oleander program and the newly installed Pioneer Array, a part of a larger NSF-funded network of observatories in the Atlantic and Pacific called the Ocean Observatories Initiative, which is positioned along the shelf break, will collect continuous measurements, so critical in understanding the dynamics of the region. Because it’s a productive fishing ground, the warming at lower depths can have a big impact on the distribution and abundance of fish in the area. A new study shows that water temperatures in this continental shelf region have been trending upward, with unprecedented warming occurring over the last 13 years. 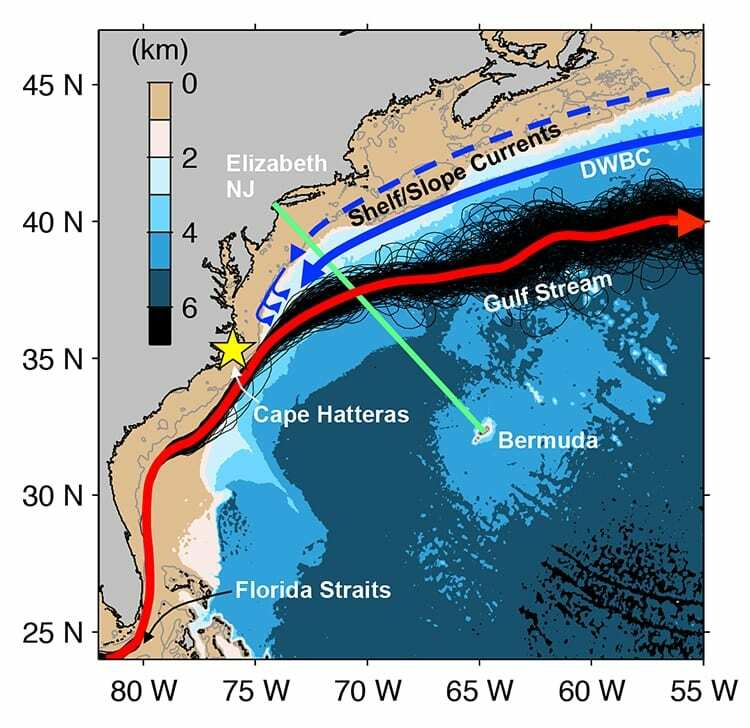 The research is based upon temperature data from the waters off the northeast coast of the U.S. that were collected in collaborative effort between scientists and the operators of the container ship Oleander, which routinely travels between Bermuda and New Jersey (green line). The mean surface circulation in the northwestern North Atlantic is shown. Cross-sectional view of the Oleander track line, which routinely traveled across the Shelfbreak from New Jersey to Bermuda. The figure shows the trends of the annually averaged temperatures in each bin along the Oleander line for (top) 1977–2013, (middle) 1977–2001, and (bottom) 2002–2013. The dashed line indicates the 80 m isobath, the mean position of the foot of the Shelfbreak front, which is close to the edge of the shelf.